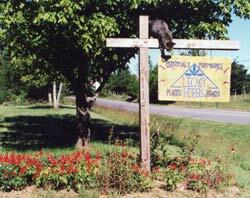 Legacy Herbs began in 1987 with the construction of a small greenhouse attached to the east side of my house in Mtn. View, photos below. I sold plants, collected wildflowers, made wreaths and potpourri, incense, and soaps and sold them in my living room. Many of the herbal remedies I've developed over the years were an answer to a personal or famiily need - the insect repellant, cough syrup, liniment, healing ointment. Some were just for the enjoyable fragrance. Inspired by working for local potters, I made my own pottery, especially suitable for herbal uses. When Raymond Creasy came into the picture, he helped build my retail shop (middle right) next to the 16 x 24 hoop greenhouse, the biggest of the 3 greenhouses I had. We still travelled to herb shows with plants and crafts, from Tulsa to Mt. Vernon, IL and I was invited to speak at events. When Raymond & I married in 2001, we closed the retail location in these photos to live in the country, do crafts, make music, and sell at herb events and through the mail. I've always identified myself as an average person and wanted my products to be affordable to the average person. My approach to wellness has been nutritional, so the teas I put together were for flavor, not for "conditions," and I tried not to advise people on how to "cure conditions" but how to eat right and stay healthy. Raymond Creasy designed & painted this. 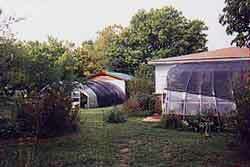 When Raymond & I married in 2001, I closed my retail location and removed all the greenhouses. I needed a break after 14 years taking care of plants. ﻿Raymond's website﻿ was hacked and the store deleted, so any flute or drum sales will be done through my store, which so far, has been protected. We were using a free shopping cart called Zencart, which I suspect made it easy to navigate. I had all the flute pictures and some of the sound files attached to those flutes. Some of his artwork is also viewable there, which we use on our CDs, our websites, and sometimes make cards from photos. He still does design work and signs for many. A native Kansan who's lived in Arkansas 25 years, Sue grew up on a ranch in western Kansas, singing at church, school programs and talent shows, playing piano, flute, & guitar, and added mandolin & mountain dulcimer as an adult. 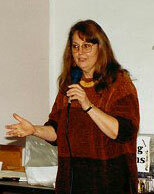 A graduate of Kansas State University, she also taught Junior and Senior High Schools for 4 years in Kansas. 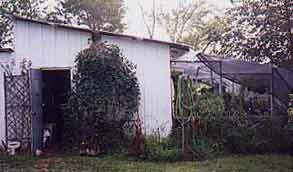 Jim and Sue Lukens made a homestead near Melvern, KS, gardening and raising animals. That was when she started learning about herbs. She left Kansas with Jim Lukens and daughter Allison to teach and demonstrate sustainable living skills in Arkansas, leaving a 200 head ewe flock and 500 acres of crop land in north central Kansas that was the Lukens family homestead. As an herbalist, she is a self-taught "back to the lander," who was a 4-H member as a kid, learning life skills from her parents. Her interest in herbs originated with her studies in organic and whole foods, helping organize food coops & an organic farmers group in Kansas. 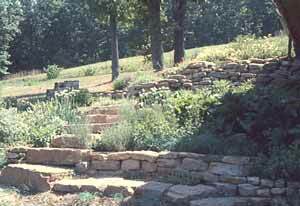 She stacked rocks & planted a display herb garden (left) and large vegetable garden at the Meadowcreek Project near Fox, AR with about 80 herb plants brought from Kansas; she also taught self-sufficiency skills there. 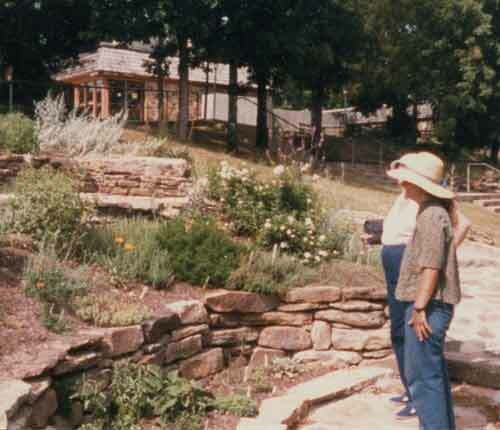 She was a gardener & interpreter at the Ozark Folk Center herb garden in 1986 (below right in the hat), the year it was dedicated and also '87. 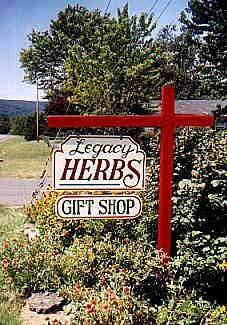 1987 was the year Legacy Herbs began, seeing the public's demand for plants and herbal knowledge. One 15x18 greenhouse started it all, later expanding with 2 more small greenhouses and a shop built by Raymond. Both a teacher and a student, she loves to lead wildflower walks in the beautiful Ozark forests, and did so with a local group she helped start called the Ozark Herb People. She worked with David & Becki Dahlstedt as a pottery helper, which got her back into making pots in a more serious way. She was employed at Stone County Ironworks, doing photography and image editing, web updates, and advertising projects. Currently, DVD and youtube projects are the latest passion on her MAC G5, with husband and musician Raymond Creasy, whom she married in 2001. That's when the plant raising and the greenhouses were closed to share a home with Raymond in the country, where water is in short supply. Herb crafting & teaching continue and marketing went to mail order & herb shows instead of having a retail location open to the public. 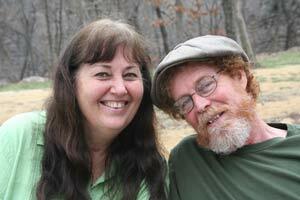 Raymond and Sue performed regularly for nearly 6 years at the Ozark Folk Center in Mtn. View. They became a duo about 1995. Together, they've recorded 8 CDs & several DVDs, several of which are at our channel on youtube; their first project was "a Legacy of Herbs." Sue recorded one previous collection of folk music, "Dave & Sue," and played in the Dixie Darlings, Patchwork, (2 all-girl bands) and Legacy with Bob and Debra Davis. 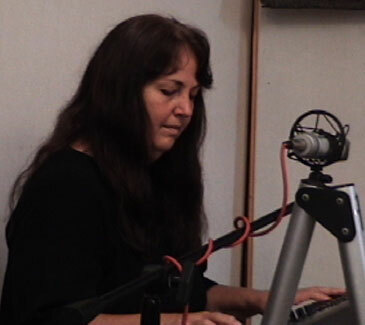 Debra played penny whistle and cello on Shamrock Dreams, our most celtic CD. 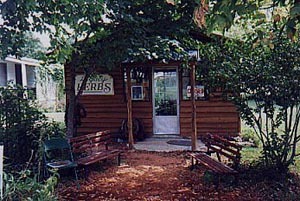 All their CDs and DVDs may be purchased at the Legacy Herbs Store.